Please, find the bios of the Ethnogala nominees 2019 here. Additionally sculptures of Tapani Kokko are displayed around Tavastia. Please, find the bios of the Ethnogala performers here. The Finnish Broadcasting Company Yle will record and broadcast the event on its TV, radio and internet channels. The broadcast will include performances and interviews from both stages as well as the green room and backstage areas. The live TV and radio stream will also be available abroad. Ethnogala tickets are available from Tiketti. Advance tickets 12-20 € and at the door 25 €. Tavastia, Urho Kekkosen katu 4–6. Ethnogala is arranged by The Promotion Centre for Finnish Folk Music & Folk Dance.  Partners include The Finnish Broadcasting Company (Yle), The Folk Music Department of the University of the Arts, the Global Music Centre, Music Finland, Finnish Music Creators, Dance Info Finland, Suomen nuorisoseurat, Folklandia cruise, Marjatta & Kaisa (maetka), Finnish folk music association, Muusikkojen liitto, Kalevala society, The Finnish Music Foundation, Suomalaisen kansantanssin ystävät (Kansallispukuvuokraamo) and the Association for Rural Education and Culture. The international program is supported additionally by Helsinki Marketing, Austrian Embassy Helsinki, Music Estonia, Royal Norwegian Embassy in Helsinki, Saura Booking Agency, Finland Benelux-institute ja Finland Madrid-institute. Images of the nominees can be downloaded here. The 2017 broadcast of the first edition of the Ethnogala can be watched here.